Need to contact Mrs. Stuckey or Ms. Thomson? Email them at stuckeya@mustangps.org or thomsonj@mustangps.org. As typewriters have been replaced by computers and ditto machines were surplussed to make way for copiers, there has been a visible constant at Mustang's Lakehoma Elementary. 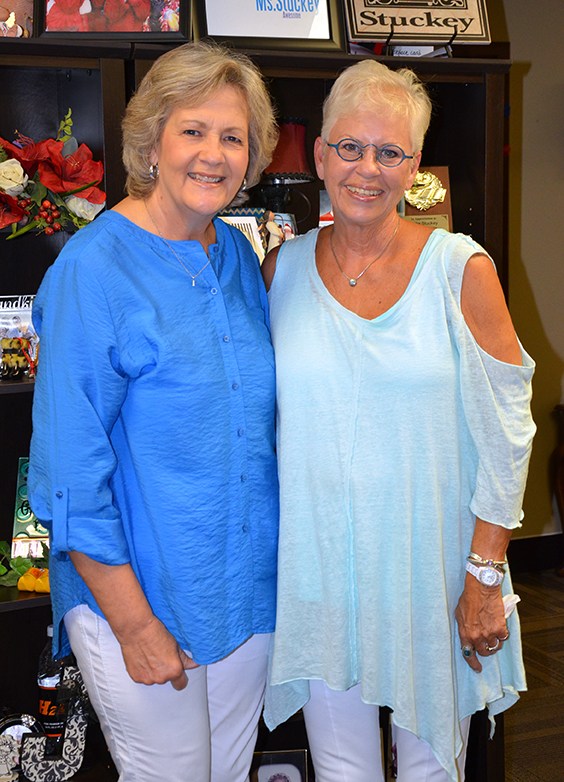 For 30 years, starting shortly after the building opened, Jill Thomson and Anita Stuckey have managed the school's front office. Stuckey, who is marking her 36th year as an employee of Mustang Schools, wasn't looking for a job in 1981. The building principal knew her though, needed a secretary and asked her if she wanted a job. Her youngest child of three had started kindergarten, so Stuckey agreed to give the position a try. She left once to move to the administration building as the activity fund custodian, but didn't stay gone long. "First of all, you fall in love with the kids. You fall in love with the parents," she said. "I just can't imagine being somewhere else." Five years after Stuckey started, Thomson was a special education teacher's assistant at Lakehoma to help pay for her son's college tuition, but she clicked with Stuckey. When the other site secretary position came open, Thomson brought donuts, marched into the principal's office and asked, "When do I start?" Stuckey said she's become the unofficial mother of the building, and Thomson is the crazy aunt. There are pictures of Thomson riding a horse through the building. And there was that one time when they drove through town with Thomson dressed in a pink rabbit outfit. Principals may set the tone for a school, but Stuckey and Thomson establish the welcoming atmosphere for children and visitors, working to the back ground noise of the ever ringing phone and the constant stream of parents, teachers and kids through the office. "Jill has great PR," Stuckey said. "She is great with kids without a doubt. There has always been a lot of business to this job. Jill doesn't care about numbers or balances. When we would do paper registers, well I would just about lose Jill because she did not like numbers. She would slam the book shut. Between the two of us, I do more of the business part and she does the PR part. That's how we go together." Side by side they've helped parents going through divorces. They've tutored kids learning to read, dried tears and been enthusiastic over every lost tooth. Like sisters, they've shared the days of their own kids graduating, getting married, the birth of grand children and the deaths of parents. "Anita breathes in and I breathe out," Thomson said. "We're not whole until we're together here." Principal Shawna Carter grew up with Thomson and Stuckey's kids. When she was named the principal, she felt like she was coming home. "They're amazing," she said. "They both remember just about any kid who went to this school. Someone can walk through the door as an adult and nine times out of 10, they know them and know them by name." Despite their partnership, they both find it hard to believe they've been at Lakehoma Elementary for three decades. "When I started here, I had brown hair. I had a neck. I didn't wear glasses," Thomson said. "I was only going to work a couple of years. One year became another and became another and now it's 30. We have just grown old together." "The reason we have stayed here is for each other and for this community," Stuckey said. "I think we make a difference for these kids. Counselors come and go but we know the guts and the hearts of these families." Carter has been clear that they can't retire and leave her all at once. They both know that's exactly what they plan to do. "The minute Anita goes, I'm out of here," Thomson said. "Thirty years is a long time - my life has changed. You blink your eyes and it's 30 years." "The day they leave I'll fall apart," Carter said. "I could have retired nine years ago," Thomson said. "Every year I think I'm going to retire ..."
Stuckey: "I've never thought about retiring." "...but then I think what am I going to do? We're just attached at the hip," Thomson said. "It's crazy."